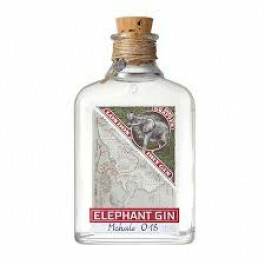 Elephant Gin is bottled at 45% ABV it is made in small batches using traditional copper stills in a craft distillery near Hamburg in Germany. Elephant Gin uses 14 botanicals, including rare African ingredients, to create the gin’s distinctive flavour profile juniper, mountain pine needles, lavender, sweet orange peel, fresh apple, cassia bark, ginger, pimento berries, devil's claw, buchu, elderflower, lion's tail, African wormwood and finally baobab - the African elephant's favourite! Elephant Gin has subtle juniper aroma, with an undertone of mountain pine & other herbaceous notes. Elephant Gin 50cl is crafted one hour east of Hamburg, Germany, using resolute artisan production methods. Bottled at 45% ABV it is made in small batches using traditional copper stills in a craft distillery near Hamburg in Germany. Elephant Gin uses 14 botanicals, including rare African ingredients, to create the gin’s distinctive flavour profile juniper, mountain pine needles, lavender, sweet orange peel, fresh apple, cassia bark, ginger, pimento berries, devil's claw, buchu, elderflower, lion's tail, African wormwood and finally baobab - the African elephant's favourite!